Paradigms in word formation: what are we up to? Paradigm is a notion closely related to morphology, and more particularly to inflection. However, the paradigmatic approach is gaining in popularity in derivational morphology even if many consider paradigms to be unfit for derivation because of the gaps and mismatches that occur with derivational processes. This results in a lack of consensus on the relevance of derivational paradigms and in a lack of a clear definition of this notion. Therefore, derivational paradigms remain mostly unknown objects that should be studied in greater depth. 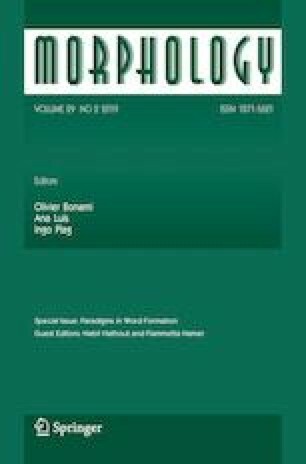 This is the very goal of the special issue introduced by this paper, namely to define paradigms for derivation, illustrate them with various examples from different languages, and evaluate them in order to assess their psycholinguistic relevance. In this way, the papers in the issue show that paradigms are as operational, valid and useful tools in derivation as they are in inflection. Moreover, a better characterization of this notion will provide new insights into the organization of lexical morphology and new perspectives on the differences and similarities between inflection and derivation. We thank our handling editor Ingo Plag for his support. This work is a follow-up to the Workshop “Paradigmatic Approaches to Word-Formation: what are we up to?”, organized in Neaples as part of the 2016 Meeting of the Societas Linguistica Europaea. Stump, G. T. (2018). Some sources of apparent gaps in derivational paradigms. Morphology 1–22. https://doi.org/10.1007/s11525-018-9329-z.